The paintings in a well-preserved tomb from more than 4,000 years ago use colors usually associated with royalty. Egypt's Ministry of Antiquities has unveiled a well-preserved tomb thought to belong to an official named Khuwy during the Fifth Dynasty. The deserts of Egypt continue to reveal the secrets of a fascinating ancient civilization best known for its towering pyramids. And now the country's Ministry of Antiquities has unveiled a well-preserved tomb with inscriptions and colorful reliefs dating from more than 4,000 years ago. 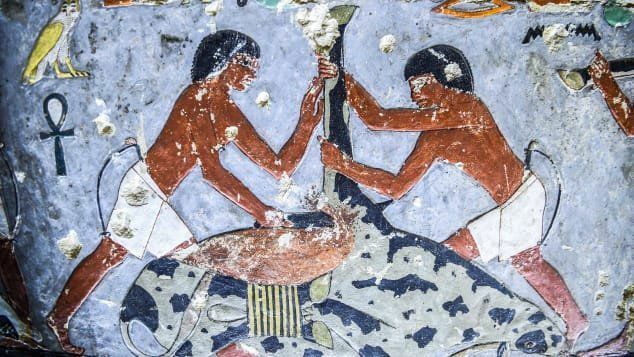 The tomb is thought to belong to an official named Khuwy, who was believed to have been a nobleman during the Fifth Dynasty, a period spanning the 25th to the 24th century B.C. Minister of Antiquities Khaled al-Enani took a party of foreign ambassadors and other officials to inspect the tomb, the ministry said in a tweet. The tomb is part of a massive necropolis at Saqqara, south of Cairo, and stands out for its distinctive design, according to an official video. Mohamed Mujahid, head of the excavation team, says the tomb is L-shaped, with a small corridor leading down to an antechamber. Beyond, a larger chamber has walls covered by painted reliefs that show Khuwy sitting at a table for offerings. Several paintings remain brightly colored despite the passage of time, in shades associated with royalty, and boasts a tunnel entrance that is usually only found in pyramids. These features have made archaeologists question the relationship between Khuwy, an official, and Djedkare Isesi, the pharaoh of the time, whose pyramid sits nearby. One theory is that Khuwy and Djedkare Isesi could have been related, while others say the tomb's unique design is the result of the pharaoh's reforms of state administration and funerary cults. Archaeologists also found Khuwy's mummy and canopic jars — containers used to contain bodily organs — broken into several pieces. They hope the tomb will give them a better understanding of the 40-year reign of Djedkare Isesi. In December 2018, officials also unveiled a private tomb containing what the Ministry of Antiquities called "exceptionally well-preserved" drawings at Saqqara. The tomb belonged to a royal purification priest known as Wahtye, according to a ministry statement. Inscriptions suggest the priest served during the reign of King Nefer-Ir-Ka-Re and was his supervisor and inspector of the holy boat. And in November 2018 archaeologists also discovered a mass cat cemetery and a collection of rare mummified scarab beetles at the site. The finds are the latest in a series of archaeological announcements in Egypt. The country is hoping to increase tourism interest in a destination that suffered following a 2011 uprising.